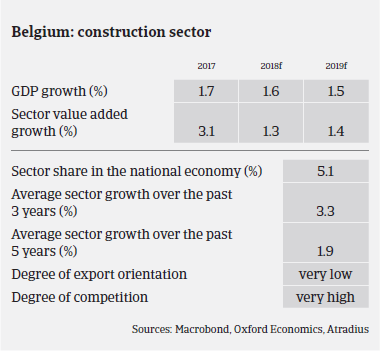 In 2017 the Belgian construction sector continued its rebound after bottoming out in 2013. The value added growth rate was 3.1% in 2017 and growth of 1.3% is expected in 2018. Working volumes continue to show a positive trend, and the industry has also benefitted from the comprehensive rebound of the Dutch construction market. Residential construction is expected to benefit from low interest rates and increased demand in anticipation of E40 (S31) energy-efficiency requirements. Current building activities shows a clear preference for flats/apartments over single-family houses, due to scarcity of space, demographic development and investors’ focus. The Flemish regional government is currently revising the registration tariffs for existing houses, which could result in procrastination in the renovation of larger houses. Commercial construction activity is expected to increase along with the improved economic environment. Public construction-related businesses had difficult times over the past few years, but since 2017 this segment has recorded increasing orders, benefitting from increased infrastructure work in the run-up to the October 2018 municipal elections. While another decrease in public construction activity in 2019 cannot be ruled out, there is some hope that Aquafin and other utility companies will maintain a high investment level. The large infrastructure work in relation to the Oosterweel link (a construction project intended to complete the Antwerp Ring Road) should help to sustain infrastructure construction activity. Construction businesses profit margins remain low, but have improved somewhat in 2017, and further improvement is expected in 2018. Currently it seems that due to the rebound larger construction companies have less leverage than in the past to play off smaller subcontractors on price, pass on price pressure and/or impose longer payment terms on them as a cheap source of financing. This is currently an issue for larger businesses that negotiated their current order portfolios in more difficult times (and consequently for a lower price). The overall indebtedness in the sector and dependence on external financing remain high, while banks remain rather unwilling to provide credit to construction businesses. 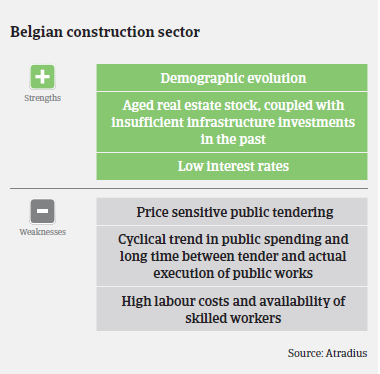 Working capital needs of companies are very high, as advanced payments are not common in Belgium, while the administration (approval of works) and payments by the Belgian government are very slow. In general, payment terms tend to be long in the sector, i.e. “60 days end of month” is very common. Payment experience has been bad over the past two years, however the number of non-payment notifications in the sector, while remaining high compared to other industries, has decreased in 2017 and is expected to remain stable in 2018. Construction insolvencies increased by more than 10% in 2017 (a 7.6% increase for all Belgian businesses). However, this major increase was also largely due to changes in the legal system, especially in the Brussels Capital region. In 2018 construction insolvencies are expected to level off. Our current underwriting stance on the construction industry is neutral (e.g. not overly cautious or overly open) for all subsectors. In order to sustain our risk appetite, it is necessary to identify the most affected companies/subsectors and to contact buyers for up-to-date financial information and performance outlooks. 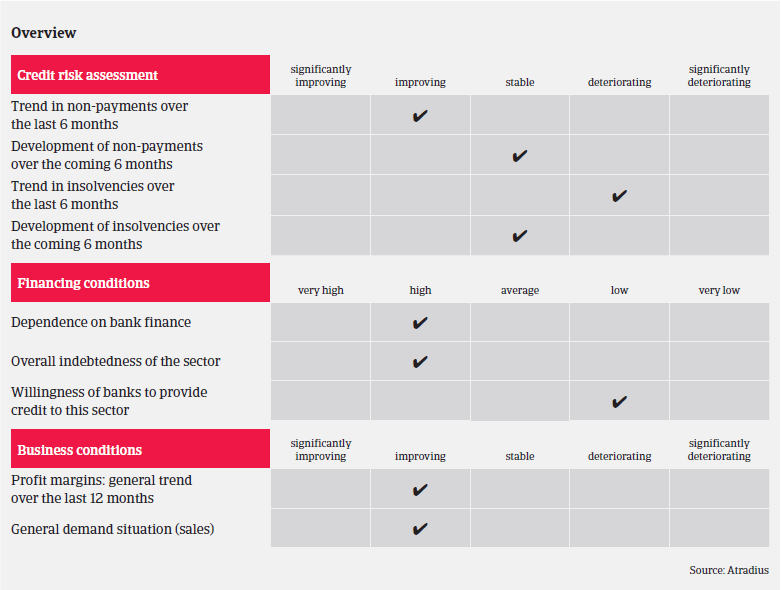 Given the improvements in business performance and credit risk seen in 2017 and the stable outlook for 2018. we have upgraded the trade sector performance rating from “Poor” to Fair”.